Pura Goa Gajah is an old 9th century Hindu cave temple in Ubud, Bali. The name means ‘elephant cave’ but no one knows why; there aren’t any elephants here. The inside of the cave has a narrow path that goes about 50 feet deep, where you’ll find some incense baskets burning. The doorway of the cave is really cool and bizarre, and it feels like you’re walking into the belly of some rock monster. It reminds me of the Buddha Park in Vientiane, Laos, but this one is a little bit different. 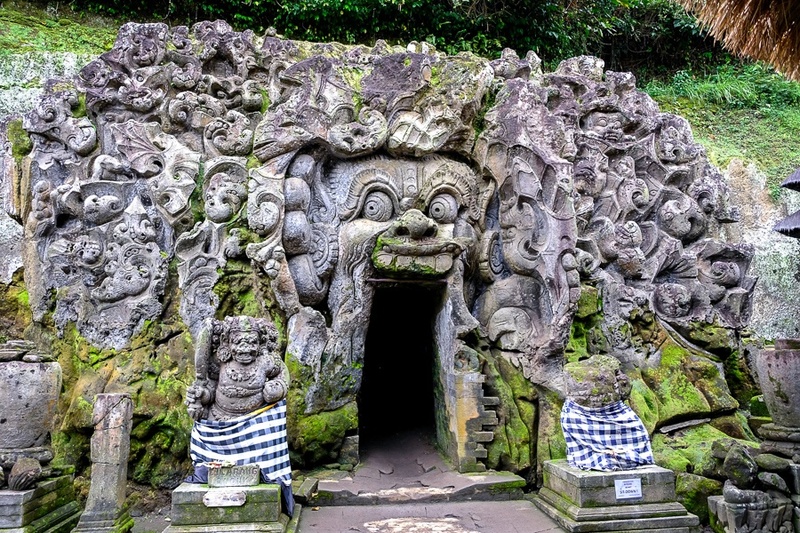 It’s easy to see why the Goa Gajah temple was a tentative UNESCO World Heritage site back in 1995. After checking out the entrance and the inside of the cave, there’s not much to do here except admire the huge banyan trees. In other words, if you’re expecting something awe inspiring, you’ll probably be disappointed. It’s still a neat stop though! The temple is located near Ubud, about 3 miles (5 km) from the Ubud market and city center. The entry fee is 50,000 IDR ($3.50 USD) as of 2019. A sarong (skirt) is required if you want to go inside the cave, but these are provided for free as part of the entry price. Ignore the shops near the cave trying to rent sarongs to you!